NEAR AN ART GALLERY IN CHELSEA - It was an unseasonably warm October afternoon, and Jony Ive was about to go on stage with The New Yorker’s David Remnick to talk about who knows what. I got there early, chugged a ginger ale, and hustled past a buffet of expensive-looking sushi to get a seat in the front row of the garage-like event space. My stomach felt queasy but not because of the ginger ale. I was a little bit nervous. Jony Ive is a celebrity not only in the tech world but seemingly everywhere these days. The guy is a knight for Christ’s sake. He’s also a regular fixture in my life, since every time I cover an Apple event, his face is bound to appear onscreen, talking about corners and anodized aluminum like the design prophet many believe him to be. In the 20 minutes I sat waiting for him to walk onto the stage, I was unable to remember the last time I’d actually seen Sir Jony show up at a live event. And here I was about to experience that very thing. What a weird relief it was when Ive appeared from behind a black curtain, trotted towards his chair, and stumbled just a little bit on the way to his chair. I think I was the only one who saw it, and I’m sure I was the only one who knew why. 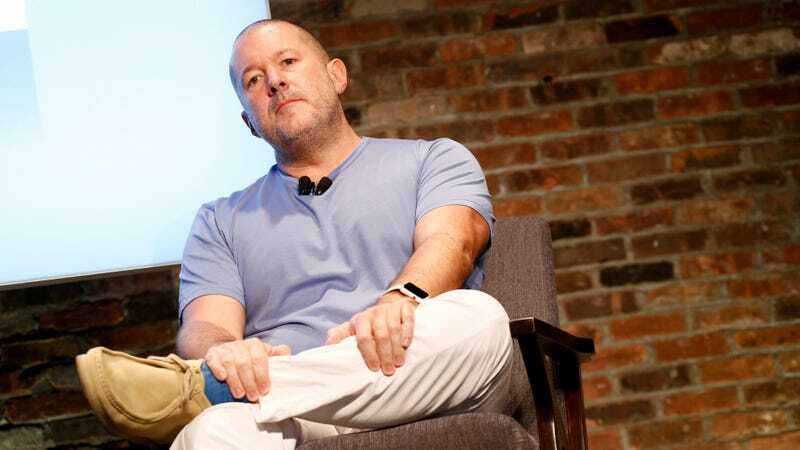 Jony Ive was wearing brand new shoes. I know this because I used to own a pair of Clark’s Wallabees myself. When you first put them on, the moccasin-style boots have a gummy, tacky sole that feels like walking on half-dried glue. And I know that Ive’s were new because there was hardly any dirt on the bottom or wear on the sole. They looked crisp, like he’d pulled them out of the box and put them on just before stepping on stage. The funny thing about seeing Jony Ive speak in real life is that he sounds exactly like he does in those iPhone videos. The first couple of questions Remnick asked were softball questions about design and the creative process or something. Ive’s answers sounded rehearsed and vaguely inspirational, like a quote you might read in an Apple Store. His British accent contributed to this, as did his surprising stature. Jony Ive is not a small man, as you might expect. He’s sturdy, like a rugby player, and wears his expressions with severity, like a brooding professor. Yet Ive seemed to soften when he started talking about Steve Jobs, his boss from 1996 until the Apple founder’s death in 2011. Remnick compared Jobs and Ive to McCartney and Lennon, though the designer seemed to struggle a bit with that analogy. He did say that he and Jobs just “clicked,” seeming almost embarrassed to use such a cliché. According to Ive, the two enjoyed a “fundamental, almost preverbal” understanding when it came to designing products, which left me wondering who he confides in now. As the conversation continued, Remnick ribbed Ive a few times about the inner workings of Apple and how he views his contributions to mankind. When asked how an iPhone might be misused, Ive even worked in a joke of his own. “Constant use?” Ive replied, winning a laugh from the audience and giving him a chance to suggest his Apple Watch as the solution to this problem. That got a laugh, too. 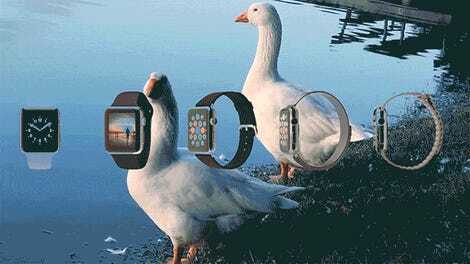 But anyone in the crowd who thought Ive might hint at a future Apple product was fantasizing. Ive said that displays were interesting (sure) and ruminated on how smaller chips would enable him to stuff more features into smaller packages. He also admitted that he thought artificial intelligence is neat, after Remnick asked. Even less surprisingly, Ive revealed that he is not a big fan of failure, but noted it’s inevitable when trying to build something revolutionary. Which brings us back to the shoes. Did Ive buy them just for this event? It seemed possible, given how rarely he makes public appearances, and his well-known attention to detail. Does Ive always wear Clark’s Wallabees, like how Steve Jobs always wore New Balance 991s? If so, I could see why he’d want to wear a new pair—those boots start looking rough after a rainstorm or two. And seriously, what was up with the scrunched down socks? I’d guess it was probably a fashion choice, not one I’d expect from the godfather of clean, simple design. It might seem silly to focus so much on footwear, but those Wallabies—and the bit of sweat he perspired onstage—revealed more about Ive than anything he said. He’s a real human being, like you and me. He has great taste in footwear, like the best of us. He’s good at design, like very few. Okay, he’s very good at design. When the interview ended and Ive walked offstage, he did so in a deliberate manner. He stopped at the stairs, looked at his feet, and stepped down slowly. When I stepped back out into the unseasonal October heat, I looked down at my iPhone to send a text. A woman walked past me carrying a bag from the Apple Store, and a man stood at the intersection tapping on his Apple Watch.